We spent a further two lovely days in the beautiful and calm Dittisham (also known by locals at 'Dittsum' - think Devon accent....) We had a view of the very pink Ferry Inn on one side and the quay for Greenway, on the other. Greenway is the estate where Agatha Christie's mansion house sits. We had seals pop up next to the boat and tour boats including a paddle steamer passing and ferries from Dartmouth passing by. 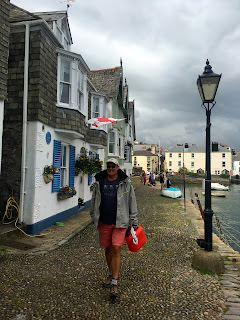 The weather was a bit rainy so a long lunch at the pub was called for and then it brightened up a bit the next day so we had a lovely walk over the hill, round a creek and across farmland to Dartmouth, followed by lunch and a ferry back to Dittisham. Exploring Dartmouth with a fuel can and a bit of rope! We totally loved the River Dart; Carolyn went as far as to say it's her favourite place we have been (Andrew's fav so far is Mevagissey). We had a dilemma as we need to get back to the Solent and Wednesday had good wind, maybe a bit too much and rain or the following days were supposed to be light winds and of course rain... So we left about 8.30am in morning in the rain and wind - oh joy! We often listen to the coast guard calls on the radio when we are sailing - today we heard an exchange between a war ship and solent coastguard - the war ship was sent to find a dinghy floating with a beer keg in it! !